How Often Should I Weigh Myself When Trying to Lose Weight? How often you should weigh yourself depends on whether frequent weighing bolsters your resolve or undercuts your motivation. 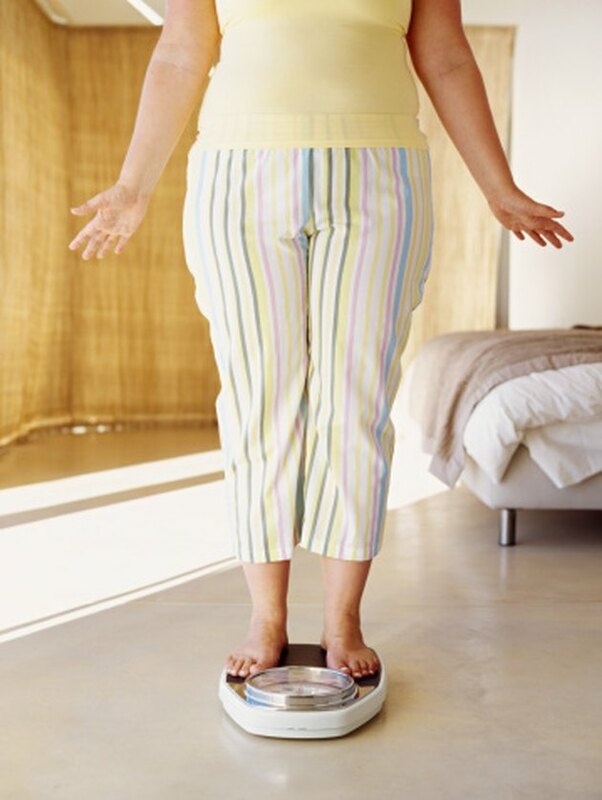 Your weight on the scale is only one factor in the weight loss experience. In some cases, waist circumference provides a more accurate assessment of your health. Scale weight and body mass index don't account for muscle weight. Pacing yourself to lose 1 to 2 lbs. a week increases your chances of keeping the weight off. When you lose weight with a healthy diet and exercise, you lose primarily body fat, instead of lean tissue and water weight. You're able to maintain a gradual weight loss more successfully than a rapid weight loss. This is why most authorities recommend cutting 500 to 1,000 calories a day from your current intake to lose 1 to 2 lbs. a week. This assumes your weight is stable. If you're gaining weight, you may need to cut additional calories. Exercise firms your body -- taking your measurements twice a month will show your body is becoming leaner. Some experts recommend weighing once a week, or even loss often, during weight loss. This is an effective approach for people who are prone to mood swings or giving up in the face of a setback. Personal trainer and author Bob Greene, best known as Oprah's trainer, recommends weighing yourself the first day of your fitness and food program -- and then staying off the scale for four weeks. His reasoning is that the initial fluctuations while you body adjusts to diet and exercise won't tell you anything you need to know. Everyone experiences weight fluctuations. Women retain water periodically due to hormone shifts. High-sodium intake contributes to water retention. Some medications can contribute to weight changes. When you begin an exercise program, or increase exercise intensity, your body stores more glycogen in the muscles for fuel. You may gain muscle weight from exercise. Muscle is heavier than fat -- but it's more compact. With resistance training -- which helps you lose weight by elevating your metabolism -- you may go down a clothing size, even if the number on the scale stays the same. Daily weighing can work for you if you use if for self-monitoring without allowing normal fluctuations to derail your program. In a 2006 study that included 1,800 women and men who were trying to lose weight, the people who weighed themselves daily lost twice as much weight as people who weighted less often, the University of Minnesota School of Public Health reports. Focusing on the basics of improving your diet and establishing a regular exercise program for the first month of your weight loss efforts -- without weighing yourself -- followed by weighing yourself daily, combines the best of both strategies. How Many Calories Do You Consume When You Weigh 240 Pounds & You Want to Lose 115 Pounds?